In some ways, this is the best time of the year. Certainly the best weather (California). The off-season gives us time to recoup, reflect and reenergize our forces for another glorious calendar year. We often entertain some exciting agendas and goals the upcoming year seems excited to hear. Much of the world of our lives is on ice. We’re taking stock, assessing the gains and losses. I watched a little tennis just an hour or two ago, one of the alleged matches of the year, 2015. I do not normally watch much WTA, but this one I enjoyed: the 2015 US Open women’s semi-final between Serena Williams and Roberta Vinci. This is a gem. Watching the Italian upset the big favorite is simply a mix of the grotesque and the sublime. Vinci’s game is such craft with perhaps underrated athleticism. Watching her slice and dice and out-hit on occasion the burly Williams is great tennis theatre. But what’s even more incredible is to watch how bizarrely awful Serena LOOKS. Pick it up in the second set and she is on the verge of tears it seems, out of breath, looks painfully out of shape. This is not an exaggeration. Vinci’s drop shots and ground-strokes eat the big younger sister alive. The Williams tragedy reaches its climax with her series of winners, that keep her in the 2nd or 3rd sets, which are accompanied by loud vulgarities, screams laced with obscenities, some aimed at Vinci (clearly), and some simply from some deep well of guttural angst that I have no idea how to explain other than obnoxious, classless or grotesque. Surreal. Vinci’s victory is pure art. I’d watch it again if it comes on and I’m still recouping, reflecting and reenergizing on the couch. Last night I caught a little of that International Premier Tennis League action. Stumbled into a Raonic v Nadal match. I have not been following this, so I haven’t stuck around to really grasp how it all works, but the team tennis dynamic is entertaining. 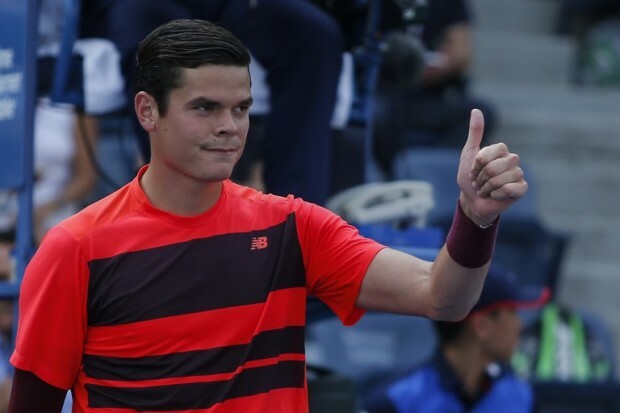 Raonic beat the Spaniard, but the light-heartedness of the whole thing was pretty obvious. Still, the team atmosphere is cool to watch, the team-mate fist-bumps, coaches (Philippoussis) calling time-out at BP to “strategize.” The benches were full of talent. The tennis reminded me of Indian Wells 2015. Raonic hit Nadal off the court in a QF. Which, of course, brings us to Ivan Ljubičić. We all know that he recently cut ties with Milos and is now, as of yesterday, on board with Federer, as his assistant coach? Back to whether or not Roger even listens to his coach. What makes this so interesting for me is that I was just arguing how Federer needs a coaching change. I explored this topic in a couple of posts: here and here. The news, obviously, makes sense to me though I am sure it caught a lot of people off guard. The way I will begin to understand this extends from the way I understand Roger at this point, which I explored back in July here, dubbing this 2014 and 2015 Roger the farewell tour; I have referred to this constantly, meaning the analogy works pretty well. The way this works is we’re watching a different version of Roger from the one we saw 2-3 or even 8 years ago – I know, really insightful, right? Ha! Actually, it has become a position in a current conversation about whether or not this is the peak of Roger Federer’s tennis existence (that is still the most ludicrous thing I’ve ever heard). The way my July post reads: this is Roger on a kind of farewell tour, floating from tourney to tourney with his beautiful entourage and 17 majors and his hair, his tennis nonchalance slapping players around this or that court, smiling and waving, etc., etc. Sure, this is a great watch. But it’s not the younger version of Roger. This is clearly a different version. Strictly tennis ambassador at this point. The Ljubičić hire is interesting because it shows he’s still fidgeting. Hell, why wouldn’t he: the ATP is a wasteland right about now with really only one or two formidable champions to speak of on a regular basis. Novak is in a world of his own, clearly. But Roger has to feel like he has an outside shot? 2015 supports this view. He and his new coach are friends, so this might look like another softball move on the coaching front from Roger. 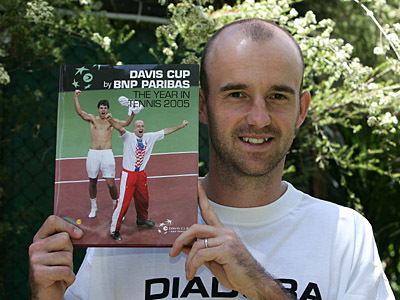 But if we recall the Croat’s tennis credentials, we see this as, at least, interesting. Ivan was always a tough opponent, stern, skilled, smart, made it all the way to #3 in the world. He’s no slouch. I think it’s quite good. Roger is fighting my discourse; he must be reading my blog. Either way, from my perspective, it’s near genius because it’s change meant to improve. How can you fault a guy for trying to overcome that one obstacle, an opponent, though a bit younger, who made a certain coaching change a few years ago. And he’s doing alright.